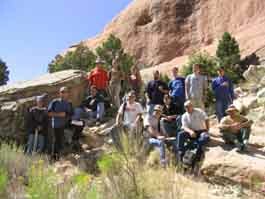 Environmental Science Degrees | Colorado Mesa Univ. Environmental problems are interdisciplinary in nature. Thus, the foundation of our program is coursework in environmental science, as well as biology, chemistry, geology, mathematics, and statistics. We build on this foundation in our upper level environmental science courses by showing how to study and solve environmental problems using concepts and tools from the more traditional science disciplines. We balance theory and practice, and emphasize hands-on work in the laboratory and field. Our courses include group and individual projects, and integrate writing and math skills. Internships are also an important part of our program. Please click here for a table showing in which courses these objectives will be addressed.